I may have the opportunity to work on a nice identity project with a client based in Dubai, Saudi Arabia, and with this possibility I need to brush up on certain skills: namely how typography, visual brand imagery and the actual finished logo design will need to translate to Arabic whilst keeping a clear brand link between the two. This potential new client sent me some homework to absorb: examples of famous brands that have been translated to Arabic including the Arabic FedEx logo. Just to make it clear that the image of the Arabic FedEx logo above in this post is NOT the official version. It is vector version I tried my best to recreate from the photographs to hand. Now I know the Arabic version of the FedEx logo is not new, but I think this is one of the few times I have actually seen it and paid attention to it. There are a few smatterings of the logo around the net, but finding a half decent image of the Arabic FedEx logo has been a fruitless task. The only versions I have found are photographs of the logo on the side of vans, and even then they are of questionable quality. You can see the official Arabic FedEx logo on the website (below). Sidenote. The FedEx logo has to have the largest selection of inaccurate colour versions of any brand I know. There are 4 just on this page alone. Bloody nightmare. The few existing blogs that have referenced the Arabic FedEx logo have pointed out the implementation of the negative space arrow within the Arabic version. 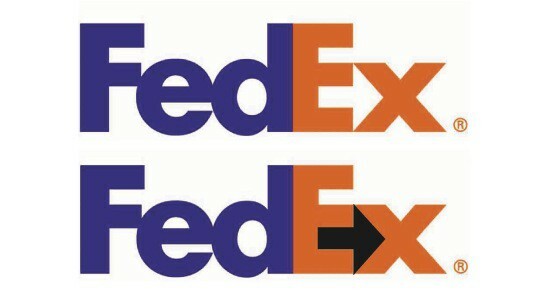 Given Arabic is read right-to-left it then makes sense that the negative space arrow follows this same reading direction as well as the design logic of the original FedEx logo. It’s a heck of a loto easier to spot the negative space arrow in the Arabic version due to the typography constraints, but it’s still a decent translation/conversion. 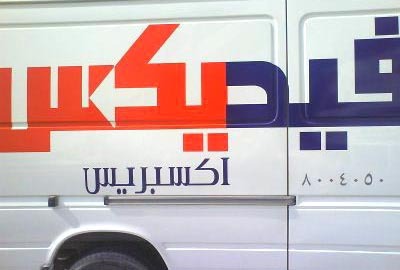 Surely not an envious task to have been responsible for the Arabic version of the FedEx logo? Let’s hope expectations were suitably realistic. Interestingly there is a unofficial version of the Arabic FedEx logo on Behance and Deviant Art (above). As far as I can tell is a reimagined idea of how it should look like according to this particular designer. The important distinction is that the original version has the infamous arrow located entirely in the red type, as it indeed should be? The concept version has the arrow sandwiched between the Fedex Pantone Purple 2685 and Pantone Red 186 letters for some reason I can’t fully grasp. I ‘m certainly not in a position to make any kind of judgement on this version given my total inability to read Arabic, but I would be interested to know the rational behind the positioning of the negative space arrow.